Surfer’s Ear is the name for the bony growth that occurs in the ear canal after cold water exposure and it can lead to hearing loss, recurrent infections or ear canal obstruction. Since the April Tax Day looms, how about reciting the things in life you can always count on? Well, taxes? Your Mum? Getting burned surfing Los Angeles on a Sunday? What else can you count on? Traffic on the 405, at least two parking tickets a year; Britney Spears weighing 2 bills in 2 years? Here is one more item you can count on if you surf: External Auditory Canal Exostoses also called Surfer’s Ear. Surfer’s Ear is common in lovers of water activities and this is especially true for surfers. That part of the ear you stick your finger in when sitting in the 405 traffic is called the external auditory canal. With Surfer’s Ear, cold water exposure causes multiple thick bony lesions to protrude into this canal. 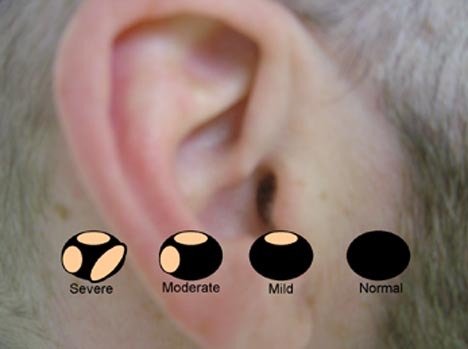 Most often these lesions are asymptomatic, however Surfer’s Ear can cause recurrent ear infections, irritation, or even hearing loss. 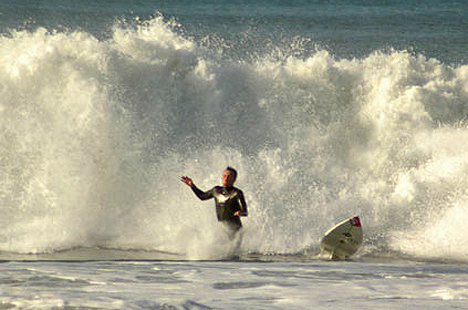 ,em>“I am a 55 year old surfer from LI, NY…been surfing since ’69. I am in very good ‘surfing shape’, ie: double sessions, even in winter, and I ride a 7’6″ thruster when conditions warrant. I surf an average of 130 days per year. I have had three “surfer’s ear” operations (one BAD, one good revision, & one very good one).” –G.S. This writer is an old timer; beware of him. When he burns you on the “7’6 thruster” and you scream at him, he really can’t hear you because of his Surfer’s Ear. (Editor’s note: ‘thruster’ is a 1980’s term used to describe a short board. The use of this term correlates highly with age greater than 50 years and a New York background). Forgive him, the Surfer’s Ear odds have caught up with him after decades of surfing. With a little prompting though, GS can teach us all about Surfer’s Ear. “I had NO infection, hearing loss, or other problems. However, 3 different Ear, Nose and Throat doctors told me my canals were 99% closed, and that waiting could allow an infection to occur, which would extremely complicate the surgery. I went with a local Dr. who claimed to have much experience with this surgery, but mainly because he was on my medical insurance plan…BIG MISTAKE. Fast forward to the operation—he drilled for 6(!) hours, and later claimed he “lost his way” and blew a hole in my eardrum that required a second surgery–obviously by a different surgeon, to be repaired artificially. I have had constant tinnitus in my right ear, along w/ a substantial hearing loss. I’ll spare you the details of the anguish I went through during this time–both physical and emotional–and just say that it was Dr. P at Manhattan Eye & Ear who “fixed” things, and he performed the surgery on my left ear, as well, with NO problems at all. I get the ears checked & cleaned (no more natural flushing in the right ear) every 6 months.” –G.S. What can you do to avoid the surgeon’s steel? Well you already know…. and don’t pretend the Surfer’s Ear made you deaf, you are reading this. Put the plugs in your ears; a 2004 study in Clinical Otolaryngology noted the plugs prolonged the time for Surfer Ear’s to develop by a factor of 5. If you compare this study to the one above, a Californian with plugs develops Surfer’s Ear at about the rate of a Hawaiian without plugs. And nobody will call you a “Haole”.